A "Smooth" badge is still a strong result for a high-fidelity game like this, showing that the frame rate was never less than 30fps -- the widely accepted minimum playability. The fact that both the 30fps and 60fps modes get the same GameBench rating means that it's up to the gamer to make their own decision: some may prefer a rock solid 30fps experience; others will prefer to have a higher frame rate when it's feasible, knowing that they won't drop below 30fps even during bottlenecks. Thinking about the progress of mobile gaming as a whole, offering uncapped frame rates is also good because it encourages studios and device makers to work together to deliver optimisations, knowing that these improvements will instantly become visible to gamers -- which isn't always the case when frame rates are conservatively capped. 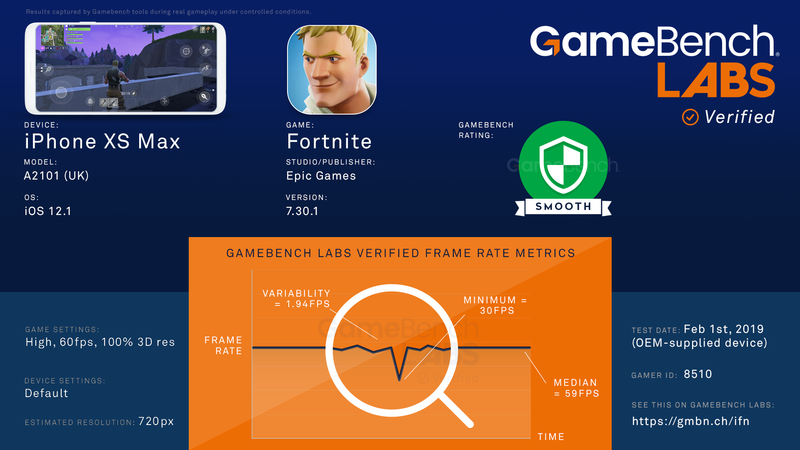 Here at GameBench Labs, we've only just figured out a consistent method for measuring frame rates on the Android version of Fortnite. (Some of Epic's anti-cheat techniques happen to get in the way of the GameBench Android app.) Our initial tests suggest that frame rate stability is likely to be an issue on Android too, but it's too early for us to provide verified results. The XDA community has shared data for an older version of Fortnite (when some GameBench profiling was still possible) showing that some Android devices struggle with frame rate stability even with the 30fps version of Fortnite, so it'll be very interesting to see how the 60fps mode fares on the three Android devices that support it (the Samsung Galaxy Note9, Huawei Mate 20 and Honor View 20). How will they compare to the iPhone XS Max? We'll have an answer soon, hopefully within the next few weeks. We shouldn't be too harsh here. In the world of PC gaming, it's common for competitive gamers to sacrifice graphical niceties like resolution in favour of maximum frame rates, so why shouldn't they have the same option on mobile? On the other hand, the resolution sacrifice does appear to be greater on Android and could potentially hurt competitiveness during long-range scanning and shooting. It's clear that Fortnite's 60fps mode comes with a couple of compromises. Firstly, we've shown that frame rate stability is less than perfect on the iPhone XS Max and we suspect that this might be turn out to be a problem on Android too. Secondly, image quality takes a noticeable hit: both the iPhone and the Android versions reduce effective resolution significantly below screen resolution, and the downscaling is more noticeable on Android. However, it's worth reiterating that neither of these issues detract from the rationale for having a 60fps mode in the first place. In a game like Fortnite, which attracts some really competitive enthusiasts, it's surely a good thing that gamers can pick their own balance of frame rate, stability and resolution. By enabling 60fps in Fortnite, Epic Games is opening up these choices and also bringing a much-needed dose of ambition into mobile gaming as a whole. Stay tuned for Android Fortnite benchmarks, which we hope will assist competitive gamers in picking the right device and the right settings to get the most out of Fortnite. Also, feel free to get in touch with us if you'd like to find out more about how we test mobile products (both games and devices) and how we can help to test yours.